IRVING, TEXAS – Union leaders from all over the state gathered here at the Sheraton Hotel, one of the few union-organized hotels, for their biannual convention June 9-11. Considering the dark days for Texas workers, and for most workers as the Republican dominated legislature is in session, the convention was amazingly upbeat. One of the highest of several high points came with the presentation of Stephanie Bloomingdale, secretary treasurer of the Wisconsin State AFL-CIO. Bloomingdale recounted labor’s fight against right-wingers led by Governor Scott Walker, and she reported on many successes. 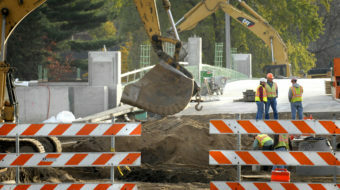 “Scott Walker did not know what he was doing when he declared war on the working people,” she told the cheering Texans. Bloomingdale credited stalwarts in the Texas Legislature of 2003 who fled the state to try to stop radical Republican redistricting. Wisconsin’s “Fabulous 14” senators borrowed the same idea during their fight to save union bargaining rights, said Bloomingdale. The seriousness of the nationwide fight, and especially the fight in Wisconsin, was emphasized. Bloomingdale continued, “This is the last chance for us to stand up and save our democracy… we will not stop until we regain our democracy!” She explained that Wisconsin Republicans are using their superior financial resources in trying to recall Democratic office holders. She said they were using paid canvassers for petitioning and “signing up dead people.” She added the GOP also announced openly that they would run “fake Democrats” during the Democratic primary. Bloomingdale left the crowd roaring with her final thoughts. “First of all, we are going to recall those Republican Senators,” she charged. Liz Shuler, secretary-treasurer of the national AFL-CIO, indicated strengths of American labor’s overall strategy in a speech. “We intend to build an independent labor movement that solidifies the power of working people in political life,” said Shuler. Building alliances with organizations outside the labor movement was an important part of the strategy, she noted. Shuler, the youngest AFL-CIO top leader in history, also talked about the efforts to recruit and train more young labor leaders. “Our goal is to have young worker programs in every state, every community, and every local union,” she said. On the final day, the most exciting speaker was Texas State Senator Wendy Davis who was already extremely popular among labor even before the final day of the legislature’s regular session when she successfully filibustered to stop giant cuts in Texas’ education. 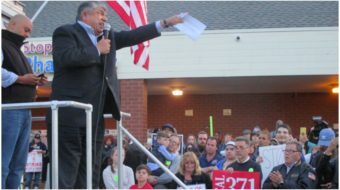 The governor here immediately called a special session, but Davis indicated that popular pressure might result in only about half as many budget cuts. The convention took place against a background of dark clouds and lightning. The Texas Legislature was still in its special session, and anti-worker officeholders were declaring that they had the votes to pass almost any legislation. Although the minority Democrats and volunteer worker lobbyists were fighting as hard as possible, the most they could hope for was to ameliorate some of the worst attacks against jobs, wages, government services, and democracy itself. 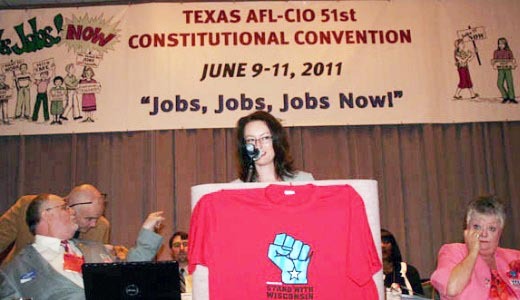 Thorough convention coverage is available on the Texas AFL-CIO website. Photo: Wisconsin’s Stephanie Bloomingdale addresses the convention in front of the banner with the convention’s slogan, “Jobs, Jobs, Jobs NOW!” Jim Lane/PW.